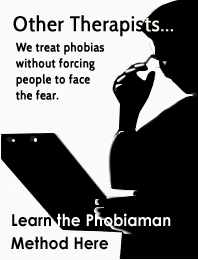 The PhobiaMan.co.uk website offers information and opinions on the topics of phobias, fear, and other anxiety related issues. All content, products, and services are NOT to be considered as legal, personal, or especially medical advice, and are to be used for information purposes only. 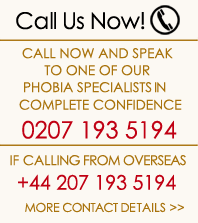 You should always consult your Doctor if you have, or suspect you may have, a phobia or an anxiety related problem. 2. Confidentiality and trade secrets: you acknowledge and agree that all content and materials available on this site, including but not limited to wording, designs, colors, and graphics are proprietary trade secrets protected by copyrights, trademarks, service marks, patents, or other proprietary rights and by other laws and that their use is restricted by the terms of this agreement. Use of the content or materials on this site for any purpose without written permission is strictly prohibited. You further agree that you will create no derivative works of this site or the products offered within. 3. Disclaimer: The PhobiaMan.co.uk website makes no warranties of any kind (either expressed or implied) concerning the materials on the site. Further, the PhobiaMan.co.uk website does not warrant that transmission of the materials will not be interrupted nor does it warrant that the materials will contain no errors nor that they will be accurate. The PhobiaMan.co.uk website does not warrant that the site itself or the server which transmits it will be free of viruses or anything else that might be harmful. Nor do we warrant that any defects will be corrected. You alone assume all risk associated with use of the site, including the full cost of any necessary repair or service to your computer. By using the site you waive any claim whatsoever against The PhobiaMan.co.uk website or it’s owners which arises from your use, whether intended or not, of any other site. This waiver specifically includes any claim arising from a product and/or service which you purchase from any site other than PhobiaMan.co.uk and any claim arising from security of information (including, but not limited to credit card information) which you use on this site. In addition, the PhobiaMan.co.uk website assumes no responsibility for any content which you find on sites that link either to or from the site. This includes responsibility for the accuracy or compliance with any laws and for any viruses or other harmful things which may be contained in these sites. Nor is the PhobiaMan.co.uk website responsible should any site link you to a site which you find offensive. The PhobiaMan.co.uk website does not endorse or warrant the quality of any goods you buy from any site other than the PhobiaMan.co.uk website. The PhobiaMan.co.uk website shall not be liable in any way whatsoever (including, but not limited to, negligence) for any special or consequential damages resulting from either your use of the site or your inability to use it or from your use of any site linked from or to the site. This limitation includes any circumstance in which the PhobiaMan.co.uk website or its representative has been advised of potential liability. Certain applicable laws may not allow all the limitations of liability described herein. Should that be the case, the PhobiaMan.co.uk website’s total liability to you for losses, damages, causes of action, and/or negligence shall not exceed the total amount paid by you (if any) to the PhobiaMan.co.uk website for the PhobiaMan.co.uk website products or services. 4. You understand that by entering your name and email address that you are subscribing to a free, no obligation email newsletter. This newsletter is offered as a free service by the PhobiaMan.co.uk website. No purchase is necessary. If you have trouble subscribing or removing, you may contact us at phobiaman.co.uk for personal attention. By entering your name and email address, you agree that you wish to be subscribed to this newsletter, and that you will make no threats, and take no additional action against the PhobiaMan.co.uk website in the event you are unhappy that you subscribed or are not able to remove yourself from this free mailing list, and you agree that the small inconvenience of receiving this unwanted newsletter will cause you no personal, emotional, or financial harm whatsoever. You agree that you have opted-in to receive our newsletter by providing your first name and email address on our website. If you do not wish to receive our newsletter, simply click on the unsubscribe link at the bottom of the newsletter. 5. Notice about testimonials: testimonials are all true, reflect the opinions and experiences of real users of The PhobiaMan.co.uk website products and services, and are submitted to The PhobiaMan.co.uk website voluntarily by customers. 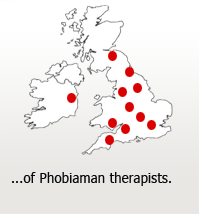 If you would like to submit a testimonial, you agree that it becomes the exclusive property of The PhobiaMan.co.uk website, which for example includes the rights to reproduce, edit (for length but not general content), and/or publish the testimonial, which may include your name or initials and city/state/country of residence. 6. Refund/Cancellation Policy. If you need to cancel or reschedule an appointment for any reason you will need to give 2 working days notice in writing (48 hours not including weekends). In this case no charge will be made. Appointments that are missed or cancelled with insufficient notice will result in the full charge for the appointment. We regret that no refunds can be given after treatment has commenced. 7. Delivery of Treatment Policy. All treatments will be undertaken at one of our clinics at at pre-arranged appointment times.